Buck hunting knives are among the most popular types of hunting knives preferred by many Americans. Created by the makers of Buck knives, these knives have set a good record for themselves, proving their worth to American hunters. Anyone who has hunted with buck knives knows exactly why these knives are most preferred by many. Buck knives were first produced in 1902 by Hoyt Buck. Since then, the knives have gained popularity and have been used in a variety of ways. There are several types of buck knives that people can choose from. There are pocket knives, folding knives, and of course, there are the Buck hunting knives. Each type has been designed to fit the needs of users. There are buck knives designed for fishermen, law enforcement, campers, collectors and the military. The buck hunting knives are designed specifically for hunters. Buck hunting knives are known for quality. These knives are made only from the best kind of stainless steel. They are extremely easy to use or handle. The best thing about buck hunting knives is that they are really sharp. Hunters can really make good use of them. This is also true with the other types of Buck knives available including the folding knives and the pocket knives. The blades of these knives are extremely sharp, making them viable for use in whatever purpose. There are several types or models of Buck hunting knives available in the market. These include the Diamondback, Alpha Hunter Folder Rosewood, Alpha Hunter 420 Drop Point with Black Handle, and the Alpha Hunter, Guthook, Rosewood. The Diamondback is a hunting knife known for its high quality and excellent design. It has a sturdy blade matched with a handle that is made of krayton tactile rubber. Collectors enjoy collecting this type of Buck knife. The Alpha Hunter Folder Rosewood is another Buck hunting knife that is a must-have for collectors. With a blade that is made from ATS34 stainless steel and a handle made with rosewood infused with resin, this hunting knife is a beautifully crafted Buck hunting knife. 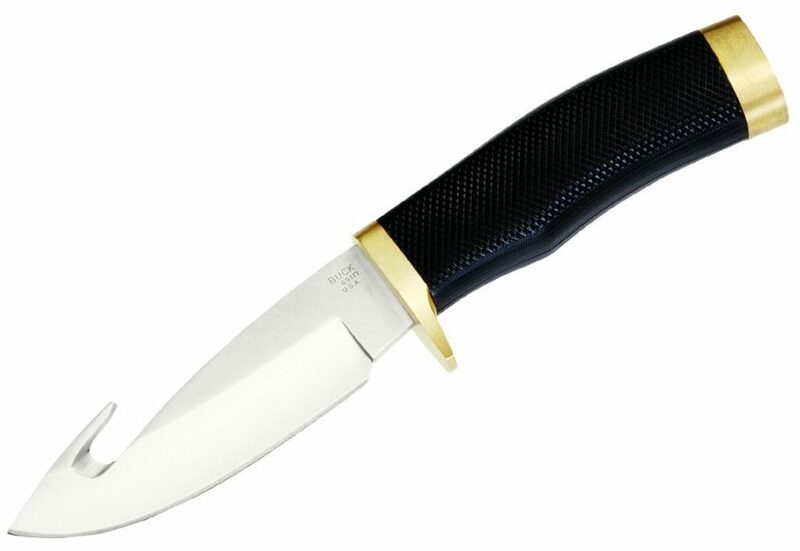 The Alpha Hunter 420 Drop Point with Black Handle is made from 420HC stainless steel. It has a rubber handle and a full-length tang. The Alpha Hunter, Guthook Rosewood models of Buck hunting knives has a rosewood handle much like the Alpha Hunter Folder Rosewood. The difference is that the former is integrated with a gut hook. When you hear Buck you think of two things, one being an actual Buck and the other is Buck Knives, and for many years, they have been a leader in the Knife market. The name Buck Knives is just like hearing Smith and Wesson guns, they just associate the name with the product. Buck Hunting Knives are one of the most sold knives at retail stores like Cabelas or Sportsman Warehouse, and that’s for a good reason they make a good product and the Hunting community knows that. Buck has been a leader in the industry for many years and there have been some new companies to pop up over the years as well, like Kershaw, Gerber, Benchmade, Spyderco, and a lot of other little companies. Even with all the competition out there, they have always been able to be the leader in their industry. Buck 301 Stockman Folding Pocket Knife has been able to create a niche of its own being the only folding knife that is bigger compared to other knives. The Buck 301 folding knife has a class of its own with its beautifully crafted design and 3 stainless steel blades that are foldable. The knife also features a clip point of 3 inches along with a black ergonomic plastic handle with an inscribed Buck Bolt classic logo. The knife has three Stainless Steel blades – sheep’ foot, clip and Spey. This is one of the best-selling and popular foldable pocket knives that are available in the market today. Buck 301 Stockman Folding Pocket Knife is ideally suited for military personnel when they are in the field. The three foldable blades are ideal for multiple tasks and serve these men well. 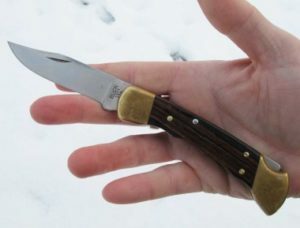 People who wander out in the woods can find this knife extremely useful for meeting their various requirements, for instance, they can use its ultra-sharp razor blade for shaving. Moreover, the knife is also ideal for camping purposes as users can easily slice and dice things with precision and it can act as a tool for cooking too. The Spey blade present in this knife has been named after Scotland’s Spey River and it is extremely popular among people who are crazy about fishing.